"By pleasing their gods, the Hive carve scars on the fabric of our realm." Urzok, the Hated is a Hive Knight that only appears during Public Events at the Skywatch on Earth. Urzok is the Hive's executioner, a title known as "The Hated", and ritualistically sacrifices other Hive. Urzok is a target for the Urn of Sacrifice Quest. Urzok is difficult to kill as he is a high-level Knight with a rapidly regenerating Arc shield and usually appears in the company of many other powerful Hive enemies. While his primary role is that of an executioner, Urzok also has distinguished himself as a brutal warrior. 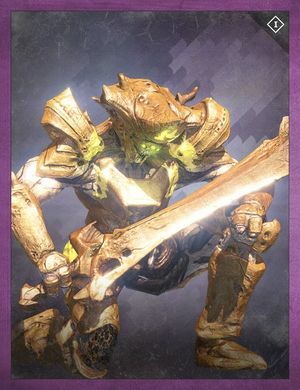 He has been seen assisting the Blood of Oryx against the House of Devils in the Skywatch, and according to Eris Morn, none who have faced the Hated have lived to tell the tale. Because of his immense difficulty to kill and his Arc shield's near immediate regen, Urzok's title is particularly apt among the Destiny community.